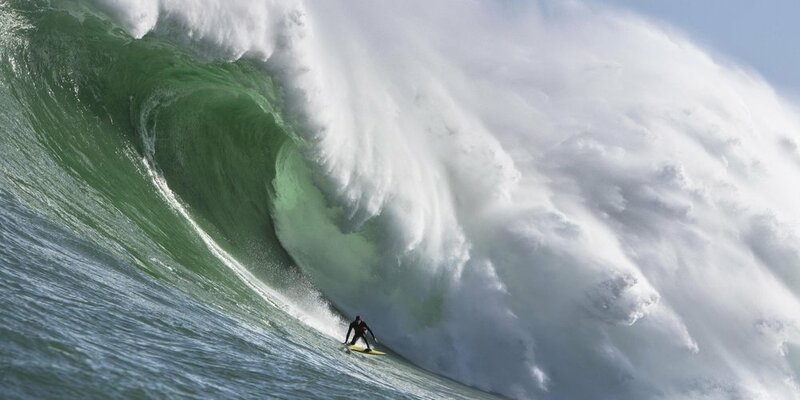 Recently, the evening news showed a clip of a big wave surfer wiping out off the coast of Portugal. Swells of water from the Atlantic Ocean hit the coastal rocks at the ancient Fort of Nazare with great force. The action produces some of the largest waves ever recorded. Naturally, for the insane big wave surfer, it has become the place to showcase their talent. When asked about the ride, the surfer described the frustration and anxiety of the successive waves. Every time he got his head above water, a new wave would hit him. Each new wave threw him down into the water and twisted him around like he was in a washing machine. The waves just kept coming, and he wondered if he would be able to get out alive. There are people in this world who enjoy dangerous rides. Thrill seekers who, literally, like to feel as though they are shaking hands with death. Then there’s the rest of us, who do everything we can to avoid life-threatening situations. We may dream of the thrill of extreme sports, but prefer it without the physical risk. Unfortunately, many people find themselves in life-threatening situations they did not search out. Conditions which come upon them without warning and offer no grand spectacle of excitement. Sometimes these situations are physical - a heart attack, a diagnosis of an illness. Other times they are emotionally debilitating - depression, anxiety. Either way, when these conditions hit, the impact is like a giant wave. One is tossed about in uncertainty, and the waves of uncertainty keep coming. When I am sitting with people who are physically wounded and worried about survival, I wonder why anyone would willingly want to risk their lives. Why would they want to jeopardize leaving those who love them behind? But some people, I guess, cannot live without the danger. I’m just not one of them. Christmas is a season of joy and celebration. Images of smiles, warm embraces and intimate settings with family and friends bombard the airwaves during the holiday season. However, for some, Christmas is a time of sickness, loss, and loneliness. Images of family remind them of loved ones no longer there to celebrate. Wrapped presents under a tree makes the hospital room seem more confining and bleak. Psalm 80 gives us words to pray when we feel fragmented and lost by life’s circumstances. “Restore us, God! Make your face shine so that we can be saved!” The words are for those stranded in dangerous water and cannot get themselves out. They are the prayer for those watch by the bedside unable to change conditions. These words turn our attention from our own state to the heart of God. For it is in the heart of God where the power change rests and is freely offered. How much do you enjoy dangerous thrills? Have you ever found yourself stranded and in need of rescue? Who have you or would you turn to for help? And, what support could they offer? What does restoration look like for you? Ordinary Voices BlogEric Elkin December 20, 2018 #Equality, #Joy, #SpiritofGod, #Serve, This world is shaped by equality, not a reversal of fortune. Ordinary Voices BlogEric Elkin December 13, 2018 #Hope, #Gratitude, #Thankfulness, #Love, Thankful hearts are full of gratitude and rarely consider themselves unproductive.